(Originally published in Art New England, Volume 4 Number 6, May 1983. An exhibition of Edgar Degas monotypes in 1968 at the Fogg Art Museum, curated by Eugenia Parry Janis, marked the beginning of a revival and amplification of the monotype form. Degas made hundreds of monotypes – fast, powerfully structured works with dazzling lights and darks, immediate and compressed. He called them “drawings made with greasy ink and printed.” Monotypes have the direct expression, immediacy of touch, the speed, the breath of drawings. They have also the vaster range of color and mark of paintings. Most monotypes are made by working with oily inks or paint on a metal plate and transferring the image onto paper by running it through an etching press to create a unique, unrepeatable image. The damp paper absorbs the paint like a sponge. Some paint remains on the plate after printing – the ghost of the first image. This can be printed as a pale cognate of the first, or reworked, changed, and printed again. Further impressions contain multitoned remembrances of things past. The image undergoes a transformation when it moves from plate to paper. What happened on several levels and over time on the plate is compressed onto a single surface. This compression slightly attenuates the image and makes it both softer and more intense. Many layers of paint and drawing can be fused onto one plane, the way we can remember in an instant events which took place over time. Monotypes can also be painted on glass or metal and hand impressed onto paper. Monoprints are uniquely inked impressions from a plate fixed by etching, lithography, or other printmaking methods. Mazur has used monotypes for landscapes, portraits, dreamlike iconic flowers, narrative sequences, illustrations for Baudelaire’s Les Fleurs du Mal. His monotypes are in numerous collections, and his newest ones can be seen at the Barbara Krakow Gallery in Boston. His most recent project was a paper mural in monotype for an MIT dormitory. 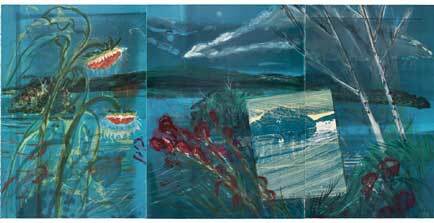 Six monumental monotypes, printed from a giant zinc plate, are assembled as two triptychs 72” x 136”, showing Wakeby Pond by day and night. The impressions were pulled on a monumental press 70” x 100”, built especially by R.E. Townsend’s workshop on Stanhope Street in Boston. 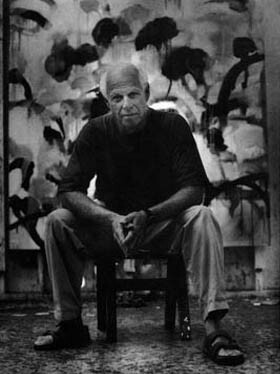 Before installation, the mural was exhibited at MIT’s Hayden Gallery, accompanied by drawings, smaller scale monotype studies, and a videotape of the artist at work made by his son. Wakeby Day Wakeby Night is a virtual encyclopedia of monotype effects. “I’ve put everything I’ve learned about monotype into them,” Mazur said. The mural portrays his well-loved summer retreat on Cape Cod, with its sunflowers and gladioli, jungle of reeds, smooth water, and little islands in the distance, by night and day. But memory is its true subject. The place is remembered over time, a composite memory of many summers, many changes of light and cycles of growth. Mazur has invented a way of working using big rollers to complicate the color, unify the surface, and move the imagery to achieve a richly ghosted effect. He rolls out fields of color, on which he paints with turpentine and diluted inks, then rolls another color over this surface, sometimes with a special roller pierced with tiny holes. On this complex field he paints with thicker paint then uses the roller lightly to pick up and offset what he has painted. Revenants of images repeat like ghostly, half-remembered things. The clearest, most lucid flowers are surrounded by a paler aura of other flowers, other summers, other interpretations. These half-seen things have at times an aching beauty, like Keats’s unheard music. The monotype form is beautifully suited to the sense of a multiplicity of life the mural portrays. The ghosts make a riot of reeds and flowers, organic growth, confusion, and decay. Pure, brilliant whites, as in the limbs of burnt trees gleaming by night, and the moon and its reflection in the water, are made by scratching or pulling paint off the plate with rags or heavily turpentined brushes, so that the white of the paper shows through. The wondrously rich blacks are made by rolling black ink over a surface already gorgeous with many layers of rolled and painted color. “Its radiance bursts forth in summer’s bright light,In clusters nestling along the dense green shade. Impressionists liked the way monotype could convey indistinct forms through tone and light and suggest an atmosphere: Degas’s gaslit stages and enclosed, intimate boudoirs; Pissarro’s blunt, movemented landscapes; Prendergast’s sun-dappled beaches. Contemporary artists have been attracted to the freedom and flexibility of the form. Each artist invents his or her own way of making monotypes. Some use the form as a way in, making monotypes to draw or paint over them, or to collage a series. Mary Frank uses collage and stencils to make deep, sculpted monotypes; Jim Dine makes dense, impacted fusions of paints and pastels. Some artists use textured materials like lace or mesh to emboss the paper; others ink up templates to print simultaneously with the plate. The Metropolitan Museum in New York and the Boston Museum of Fine Arts staged the first major monotype exhibition in 1980-81. The Painterly Print show and catalogue catalyzed appreciation of monotype’s attributes and possibilities. Wakeby Day Wakeby Night is on permanent display in the lounge of the MIT dormitory at 500 Memorial Drive, Cambridge. Also see my Elegy for Michael Mazur in The Agni Review, 2009. This entry was posted on Sunday, May 1st, 1983 at 2:54 pm and is filed under Art New England, Prints. You can follow any responses to this entry through the RSS 2.0 feed. You can leave a response, or trackback from your own site.